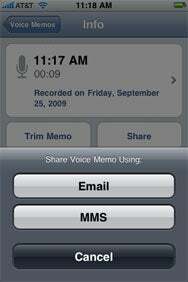 You can now send pictures, video, contact and location info, and voice memos via the newly supported MMS capabilities for the iPhone 3G and iPhone 3GS. Multimedia Messaging Service support for the iPhone 3G and iPhone 3GS is now available, giving AT&T subscribers in the U.S. the same functionality other iPhone users have enjoyed since the June release of the iPhone 3.0 software update. The newfound ability to send pictures, location data, contact information, voice memos, and video via MMS integrates so seamlessly into the iPhone’s existing messaging features, you’ll wonder again why AT&T delayed support for the capability in the first place. The carrier settings update from AT&T arrived at around 10:30 a.m. PT on Friday, and I’ve spent the better part of the morning testing the new service. Here’s what to expect when you take MMS for a test drive of your own. Make sure you’re running the iPhone 3.1 update. Connect your iPhone, go to iTunes, and check for software updates. You should be notified that there’s an update to the carrier settings for your iPhone. Turn the power back on, and you should be good to go. Got MMS? The camera icon on the left indicates that you do. You’ll know that the update installed properly by going to the Messages app. 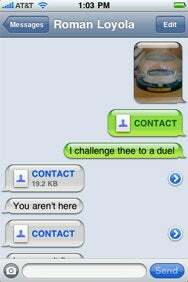 The field for entering text messages should have a camera icon just to left. If not, disconnect and reconnect the iPhone and try again, consulting Apple’s MMS troubleshooting guide for any additional assistance. So now that you have the ability to pester friends and contacts with photos of your cat, how do you go about doing it? From the Messages app itself, just tap that camera icon; your iPhone will prompt you to either take a photo or choose an existing image from your camera roll. If you opt for the former, the camera will launch, and you tap to take the shot. You’ll see a preview image with options to either use the photo or retake it if you're dissatisfied with it. You can write some text to accompany your picture, but the text and image appear in separate balloons when they’re sent. Once you’ve selected an image, a thumbnail version of it will appear in one of Messages’ dialogue balloons. You can also type a text message to accompany the picture, though once you hit send, the image and text appear in different balloons. 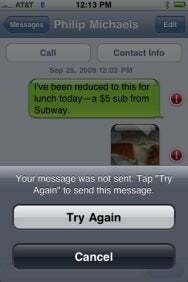 In my admittedly limited texting experience, sending a simple SMS message on the iPhone has always been a zippy affair. Sending a picture takes a little bit longer—not so much that it’s frustrating but enough that there’s a noticeable lag between when you tap Send and when the image actually goes out. 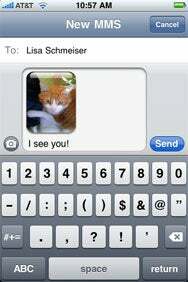 You can also send images via MMS from within your photo roll. Simply tap on the share button (the icon with the arrow) for the photo you want to share—an MMS option now appears alongside the Email Photo, Assign to Contact, and Use as Wallpaper commands. Tap MMS and the iPhone produces an MMS with your selected image—all you have to do is fill in the recipient and any accompanying text before tapping send. Sending other content via MMS—location data, contact info, and voice memos—works much the same way. There’s no option for sending these from within Messages; instead, you go to the relevant app—Maps, Address Book, or Voice Memos. Say you want to let a contact know where you are, for example. Just tap on the blue dot showing your location in Maps, and tap the blue arrow when it appears. The Share Location button now offers an MMS option in addition to e-mail. Tap it, and you’ll get a screen similar to the one that appears when you send an image via MMS: the tappable contact data appears in a message awaiting a recipient. Whether it’s an image, video, vCard, map location, or (in this case) voice memo, there’s now a tappable MMS button if you want to share that content with someone. I don’t own an iPhone 3GS so I was unable to shoot and share video. However, my colleague Roman Loyola owns one of those fancy-pants phones, and he tells me that sharing a video works exactly the same as when you shoot a picture on the iPhone and share it via MMS. More important, even though I don’t have a phone equipped with a video camera, I was able to watch the video clip Roman sent me from within the Messages app. All I had to do was tap on the thumbnail—the video appeared on a separate screen with pause and play controls. (Indeed, tap on anything other than text in the Messages app—an image, an audio memo, a contact, or location—and it will appear on its own screen.) And while I could save the video to my camera roll, I was unable to subsequently forward it via Messages. That’s not the case with images—once I saved them to my photo roll, I was able to share via MMS. I was also able to easily save contact data (either by tapping Create New Contact or Add to Existing Contact) and location info that I received via MMS, and I could tap share buttons to forward that data on to other contacts. There’s no way, however, to save or forward voice memos—at least, none that I was able to find in my limited time testing this functionality. At the risk of stating the obvious, I can also confirm that your MMS messages aren’t limited to iPhone users. I was able to send an image to someone who’s still scraping by with an aging Treo, and she received it without any problem. I had no problem sending out MMS messages on Friday. My colleague Dan Frakes wasn’t so lucky. When AT&T didn’t support MMS functionality out of the gate, the widely held assumption was that the carrier feared its network would be unable to support the crush of iPhone users happily texting each other maps and videos. Indeed, as the September 25 launch date for MMS drew closer, there was some degree of fretting—including within the walls of AT&T HQ, reportedly—that the 3G network wouldn’t be able to hold up under the strain. I haven’t noticed any problems with the MMS messages I’ve sent out Friday, but I’ll readily admit my experience might not match yours. My colleague Dan Frakes, for instance, tried to assist me in my testing, but had trouble sending messages—presumably because a large number of our fellow iPhone users are trying to do the exact same thing. What’s your iPhone MMS experience been like? Let us know in the comments.